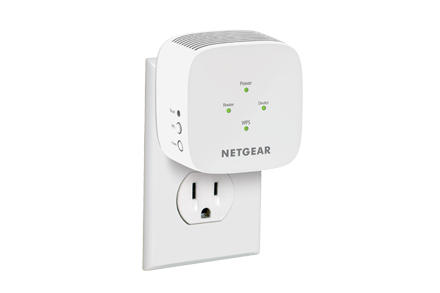 NETGEAR AC750 WiFi Range Extender boosts your existing network range, delivering AC dual band WiFi up to 750Mbps. It works with any standard WiFi router and is ideal for HD video streaming and gaming. Get the connectivity you need for iPads®, smartphones, laptops and more. Optimize your existing WiFi network and extend it to hard-to-reach places with the next generation AC WiFi technology. Just plug it into any outlet and experience the difference. Create stronger WiFi access for 802.11 b/g/n & ac WiFi devices. Extend 2.4 & 5GHz WiFi up to 750Mbps & reduce interference. Use both WiFi bands to establish one super high speed connection; ideal for HD streaming & gaming. Works with any standard WiFi router. FastLane™ Technology - Use both WiFi bands to establish one super high-speed connection; ideal for HD streaming & gaming. Smart LED indicators find the best location for your range extender. Download the NETGEAR EX3110 Datasheet (PDF).